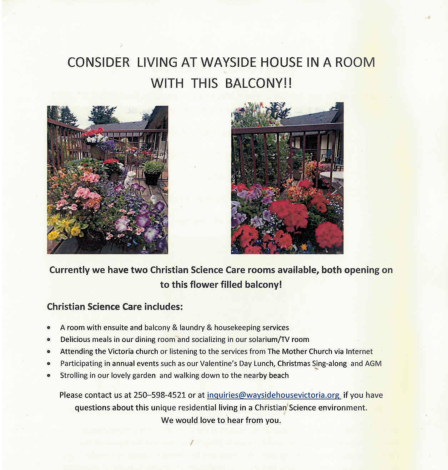 The primary mission of Wayside House is to provide skilled Christian Science nursing care in an atmosphere of peace, joy and expectancy of healing. As well as offering a spiritual atmosphere for physical healing, Wayside House invites you to take some time and experience the mental benefits of Spiritual Renewal. Busy schedules and the demands of every day life can sometimes erode the natural sense of unity with God. Come and benefit from a quiet, spiritual environment and connect with the sustaining influence of “the things of the Spirit.” Take the opportunity to rediscover your divine nature as God’s child. A Wayside experience is an opportunity for prayer, rejuvenation, and refreshment. 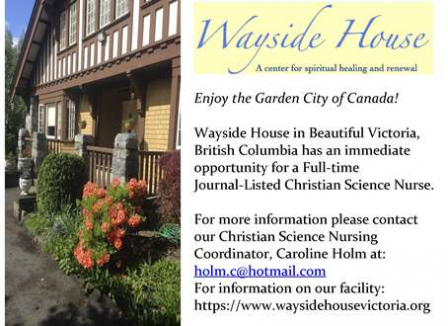 Wayside House is a registered Canadian charitable organization, and is licenced as a private hospital by the Province of British Columbia. News: Come & join our Wayside family! 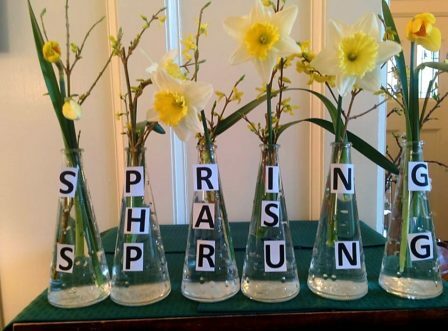 News: Spiritual Renewal Special – Spring & Summer 2019. News: You can live at Wayside House!